I’ve been reading Joel Beeke’s book ‘Living for God’s Glory’. 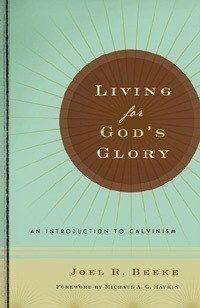 It describes itself as ‘An Introduction to Calvinism’ but with over 400 pages it is not to be regarded as just a primer. It’s is a very comprehensive review of Reformed thinking, presented in a readable and easily digestible format. Don’t let its bulk deter you from purchasing it. The book explores the history and development of Calvinism, (which, of course did not start with Calvin) and in that context introduces the reader to some of the Reformed Confessions. As a Congregationalist, I find it a little disappointing that the Savoy Declaration gets little more than a passing mention, while the WCF and the London Baptist Confessions are given a chapter each. Savoy gets only a passing mention, yet it was the work of several great Puritan thinkers, for example John Owen and Thomas Goodwin. The book goes on to examine Calvinism in thought, it’s doctrines and philosophies, and the effect of those doctrines upon the heart of the believer. Two chapters are devoted to sanctification in Puritan thought and in the Practice of the Puritans. Other authors chip in on this too. In the section on ‘Calvinism in the Church’. Derek Thomas writes on ‘Reforming the Church’, Jay Lanning on the ‘Foundations of Reformed Worship’ and Robert Oliver on the ‘Roots of Reformed Preaching’. Nelson Kloosterman deals with ‘Calvinist Ethics’ and Sinclair B Ferguson sums up the work in a section titled ‘Doxology’ in which he defines Calvinism’s ultimate goal – Sola Deo Gloria. This is balanced genuine, defensible Calvinism. It is the Calvinism expressed in Isaiah 9:6 which says that the government or sovereignty is upon the shoulders of Him who is Wonderful, Counsellor, the Mighty God, the Everlasting Father, the Prince of Peace. In Christ, the warm and fatherly sovereignty of the God of the Scriptures is vastly different from the cold capricious sovereignty of other ‘gods’ such as Allah. Fatherly sovereignty like the incarnation itself is in perfect harmony with all of God’s attributes. The Calvinist finds peace in the conviction that behind God’s all-compassing providence is the full acquiescence of the triune God. The sovereign grace and love that went to Calvary has the whole world in its hands. God’s fatherly sovereignty in Christ is the essence of who God is. Now, to my mind, that is one of the clearest definitions of the heart of the Reformed Faith that I’ve ever read. I recommend this book heartily. It is well laid out, and well thought out. If the reader is new to Reformed Theology and Doctrine, it will be fairly easy to read and will lay down some very good basic foundations. For those already familiar with Reformed thought, it will help both to clarify issues, and to further encourage us in systematic thinking about our faith.